By João Fernandes, Founder and CEO of BuzzStreets. 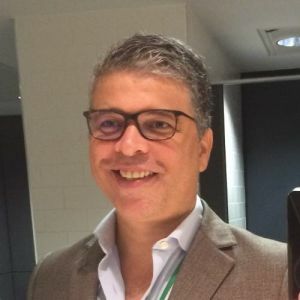 João Fernandes, a UK-based Portuguese is the founder and CEO of BuzzStreets, a B2B navigation and location-based services solution. It combines indoor and outdoor navigation with technologies such as augmented reality and proximity-triggered offers, to create a bespoke solution for customer engagement. The analytics the solution can also be invaluable in improving building efficiency and keeping track of vital equipment. Particular verticals that could benefit from BuzzStreets include: Shopping Malls, Stadiums, Hospitals, Airports and Offices. "We all walk around with a detailed map of the world in our pockets – navigating our way around is easy. But what happens when you enter a building? The navigation drops out. That’s because map technology is enabled via GPS (satellite technology) and is not good at picking up phone frequencies from within buildings. This can be a big issue in complex indoor environments, such as airports. Passengers arrive with little-to-no idea how to navigate to their departure gate, wandering aimlessly around looking for directions, leading to long queues at security, missed departures and angry customers. Fortunately, solutions to this particular problem have already been developed. Most use Bluetooth beacons positioned around a building’s interior to ping a user’s mobile device, allowing an app to pinpoint the user’s location to within a few feet. Of course, there are more sensitive solutions which allow for centimetre-accurate positioning, but that’s usually overkill for something the size of a person. These beacons are steadily becoming cheaper and more reliable, making them a cost-effective solution for most large and complex indoor environments, such airports. Every environment has its own unique technical challenges to be ironed out, however, meaning indoor navigation requires an expert consultancy rather than a DIY approach. BuzzStreets, for example, is working on a number of pilot projects with airports, hospitals, and stadiums to iron out these kinks, while Google offer DIY indoor mapping without navigation features. In the very near future, we will see the combination of these technologies, providing a quick and simple solution for buildings of any size. At this point, we will quickly reach a critical mass of businesses providing indoor navigation and the whole world will be navigable – indoors and out. Indoor navigation isn’t just about getting people from A to B, however. It is also about the journey. Indoor environments like departure lounges could be made so much more interesting and engaging. Most airports already offer free wi-fi and digital games to keep kids entertained while they wait. By developing these into immersive experiences, airports have the opportunity to create a fun space where people enjoy waiting. Imagine going into an airport and seeing marine animals swimming through the air, with games and news appearing on virtual screens around you. As you approach your favourite fragrance counter you can already see whether they have the perfume you wanted before receiving a special discount code. As you step inside the lighting changes and your favourite band plays softly in the corner. BuzzStreets is already playing around with augmented reality (AR) ideas such as these to offer travellers and shoppers a rich, immersive environment to explore. And when handsfree, wearable devices become the mainstream, this futuristic vision will become a reality. Until then, we will still need to use our smartphones and tablets as a window to this world. Anonymous navigation data also holds a great power. With over 78 million people travelling through Heathrow alone each year airports can’t wait for the results of a five-year trial before making important changes. The world is too complex and fast-moving for that traditional approach. Gathering data in real-time allows us to put our theories to the test, develop new models, and make useful changes quickly and accurately. How do people move around your airport? What route do they take to get there? Where does your departure lounge get the highest footfall? When and where are people most likely to buy food? Data can help answer all of these questions and many more. Airports can optimise their environments to improve the user experience, save money, and improve security. There are almost infinite ways in which the data gathered by navigation software could be used to improve our lives. The only limit is our imagination. Does this mean that as I’m aimlessly blundering around reading the overhead signs to where I want to go at Heathrow, others, glued to their phones using the App will be crashing into each other?